I recently visited a rummage sale at my local community college, which was trying to get rid of a ton of old and outdated equipment in storage to make way for a new Makerspace. As I browsed through the piles of nearly antique lab equipment, I stumbled across a small but valuable looking chest with a 4-digit combination lock. There was a piece of paper taped to the top, but it mostly looked like a random jumble of colored squares. Oh, that looks like Professor Margotof's old chest. He just left it here when he retired, and we've never been able to get a hold of him since. We think that paper used to have a hint to opening it, but some of his pet critters got a hold of it and messed it up. It's a shame, really. He used to keep some of his research results in there. No telling what sort of history that box holds! My curiosity piqued, I ask about the "critters". The critters? Those were a pet project of the Professor's, if you'll pardon the pun. It's hard to describe what exactly they were, because they didn't really have any intelligence, but if you got enough of them together they behaved like they did. He had three different types, and while they all behaved the same, they never interacted with any critters of another type, sometimes even passing right through each other. And here's a smaller version, where each square is one pixel. Can you unscramble the clue and find the code? Good luck! As shown above, there are 4 columns of 5 letters, and the word MeRCY. Since the 'e' is lowercase, we'll ignore it and just use MRCY. This puzzle is all about colors, so I'll take that as Magenta, Red, Cyan, and Yellow. 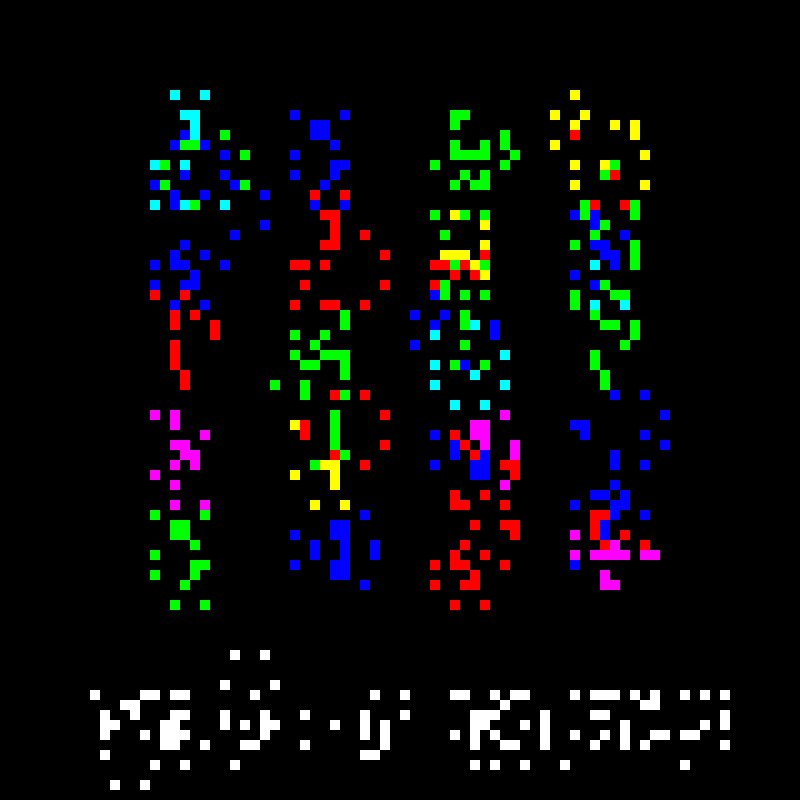 Taking the respectively colored number out of each column produces 1955.
cellular automata. Specifically, I guessed that it would involve the reversible block cellular automaton rule named Critters by its inventors, professors Margolus and Toffoli. splitting the image into RGB components. transposition cipher. 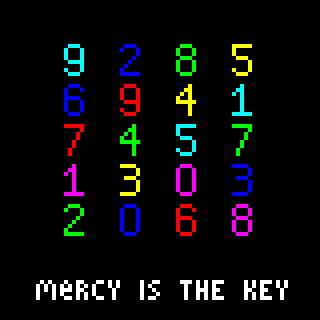 Since there were five rows and four columns, and since the keyword "MERCY" had five letters while the answer was supposed to be a four-digit number, I figured that the keyword probably indicated which number to pick from each column. Since the alphabetically first letter in the keyword, C, was in the fourth position, I tried picking the fourth number in the first column, i.e. 1; then, since the alphabetically next letter, E, was in the second position, I took the second number in the second column, i.e. 9, and so on. it's the year in which the description of the Critters CA rule was first published. Here are some of my findings so far in case it helps anyone. The three critters I figure are red, green, and blue. The other colors are just combinations of these (cyan = g+b, purple = r+b, yellow = r+g, white=r+b+g). This probably means that cyan indicates that it is both a green and blue cell. The question is tagged with cellular-automata, so that is probably what the picture represents. I tried transcribing the red cells (purple, yellow, and white included) into a Conway's game of life simulator but nothing interesting seemed to happen. Edit: Based on Ilmari Karonen's guess and DqwertyC's comment, here is my answer. The comment noted that something is odd about one of the letters. The letter is the e in MeRCY, as it is lowercase. So instead of skipping the last letter alphabetically, we skip the e. Then, we pick the 4th, 1st, 3rd, and 5th numbers to form 1258.
this answer doesn't have a nice justification like 1987 does. But maybe this was just a red herring. Not the answer you're looking for? Browse other questions tagged computer-puzzle computer-science cellular-automata or ask your own question.